Senate Intelligence Committee Chairwoman Dianne Feinstein, a Democrat, speaks to reporters Tuesday about the report on CIA interrogations at the U.S. Capitol in Washington. The Senate report released Tuesday on the CIA’s use of harsh interrogation techniques during the George W. Bush administration comes at a time when Americans’ support for such techniques are at a high point. The report exposes new details about the agency’s secretive use of particularly brutal interrogation methods — including sleep deprivation, waterboarding and sexual threats — but it may not shift public opinion. Karlyn Bowman, a senior fellow and research coordinator at the American Enterprise Institute who analyzes data on American public opinion, said she agrees. “It’s possible people will be shocked when they read some of the report,” Bowman said. “It could have a short-term effect, though it’s hard to know if it will have a longer-lasting effect now in the world” of Islamic State. Data shows that popular opinion on the use of torture by the U.S. government has subtly shifted since 2004, when Pew Research Center began polling Americans on the subject. Pew asked whether torture used against suspected terrorists to gain important information is justified, finding a majority of respondents (53 percent) said torture could never or only rarely be justified. But over the next five years, public opinion slowly reversed. 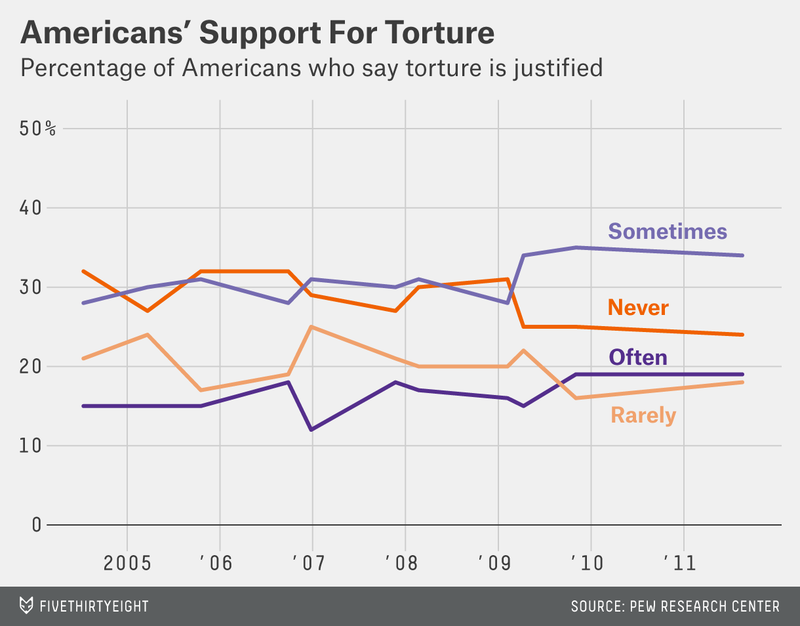 By November 2009, a slight majority of Americans said for the first time that torture could sometimes be justified. In Pew’s 2011 report — its most recent — 53 percent said the U.S. government’s use of torture against suspected terrorists to gain important information can often (19 percent) or sometimes (34 percent) be justified, marking a turnaround from 2004. Dunlap, who retired from the Air Force in 2010 as a major general, said this shift in popular opinion may be event-based, evolving in step with an increased perception of the brutality of terrorist attacks occurring abroad. “It could be that some in the public have concluded that exceptionally extreme threats from heartless enemies requires exceptionally tough measures, to include harsh interrogation techniques,” Dunlap said. Bowman, though, said the shift might instead be the result of an increased polarization among Republicans and Democrats. 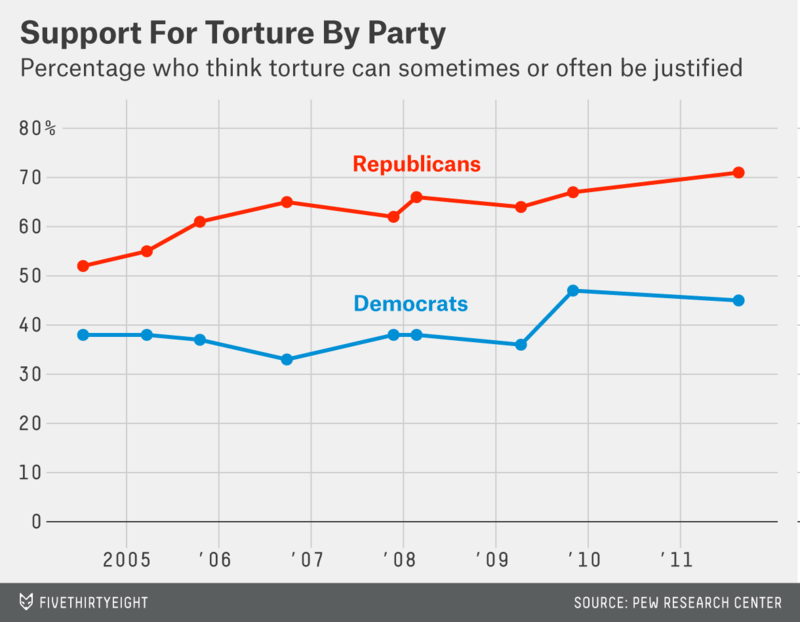 There are stark differences in opinion on torture along party lines. A large majority of Republicans (71 percent) said torture could be at least sometimes justified, compared with 51 percent of independents and 45 percent of Democrats, according to Pew research. A more recent poll, conducted by the Associated Press in 2013, confirmed Pew’s findings. AP found that a little more than half of Americans said they favor the U.S. government’s use of harsh interrogation techniques against suspected terrorists to seek information about terrorist activities: 28 percent said they strongly favor them, and 23 percent moderately favored them. The same survey found that 22 percent of Americans strongly opposed harsh interrogation techniques and 16 percent moderately opposed them, with 11 percent reporting that they are either neutral or undecided. Notable is the AP poll’s use of the phrase “harsh interrogation techniques,” which is more commonly employed by supporters of such techniques. The Pew surveys, on the other hand, use the word “torture,” a word favored by critics of methods such as waterboarding. Harry Enten contributed to this article.